Looking for a party favourite, give it a try. Preheat oven to 400Â°. Combine salt and pepper in flour. In a bag, cover wings with flour. Remove any excess flour off chicken and toss with olive oil. Place on a pan lined with parchment and bake 40 minutes turning at 20 minute intervals. Meanwhile, combine sauce ingredients in a small pan. Bring to a boil, reduce heat and simmer about 5 minutes or until reduced by half. Take wings from oven, smother with sauce and return to the oven for 10 minutes, turning after 5 minutes. Serve hot and garnished with sesame seeds and chopped chives. Tip – You can substitute foil for parchment, canola/vegetable instead of olive oil and all-purpose seasoned flour if you donât want the salt and pepper. If you have seasoned the chicken with salt, then make sure the flour has little to no salt. 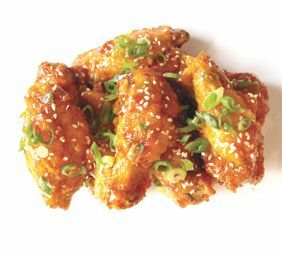 Replace the honey with maple syrup and you will have fabulous maple honey garlic wings.